If you’d like to protect your expensive exterior door from wear and tear, increase your home’s energy efficiency and enjoy the weather and sunlight year round, you might be interested in installing a storm door. These doors are installed over your exterior door and may offer several different benefits. Read on to learn everything you need to know about storm doors, so you can decide if your house needs one. A storm door is a valuable addition to your home, all year round. While working or hanging out at home, it’s pleasant to let in the breeze and natural light by opening up the door. However, this also means that insects, dust and leaves are invited in as well. Depending on where you live, it could also pose a security risk. A storm door allows you to open your exterior door for some sunshine or even a breeze if your storm door has a screened panel while the storm door remains closed and locked. When the weather gets cool, you don’t have to be doomed to being inside the dark house all day. Your storm door’s glass panel will keep the icy air out but let the sunlight enter your home. When both doors are shut, that storm door will also provide an extra layer of insulating protection against drafts that hike up your utility bills. In the fall, you can enjoy a cool breeze during the sun’s peak in the afternoon without that leaf pile finding its way into your living room. While some storm doors only give you the choice of screen or glass, it’s nice to have more options. Other storm doors feature half-screen, half-glass, while some have panel inserts that can be switched out. This is a nice feature for those who like to have more control over storm door operation: you can switch to the glass panel in the winter to let in the light but not the cold, and in warmer seasons you can switch in the screen and enjoy both the sunrise and the breeze. How Are Storm Doors Made? A good storm door has solid wood, covered with permanent aluminum skin. Don’t worry, today’s storm doors aren’t hunks of barn metal: they’re engineered to be an attractive part of your home with a baked enamel finish in any matching or complementary color. Other storm doors may have vinyl cladding. These are less expensive and don’t rust, but they also don’t have the heavy-duty feel of aluminum. Depending on your security needs, you may need to emphasize strength a little more than attractiveness when selecting your ideal storm door. You can find a decorative storm door that fits with your own unique taste. You’ll be able to choose how much of the panel is glass: full glass, three quarters glass, or just the top portion for a view out while standing. You can get beautifully patterned or gridwork glass panels, plain clear glass, tinted glass and even glass with special low emissivity coatings to reflect harmful UV rays away from your interiors. The door frames are also available in almost any color you could possibly want. Extra security doesn’t have to be an afterthought when it comes to your storm door. 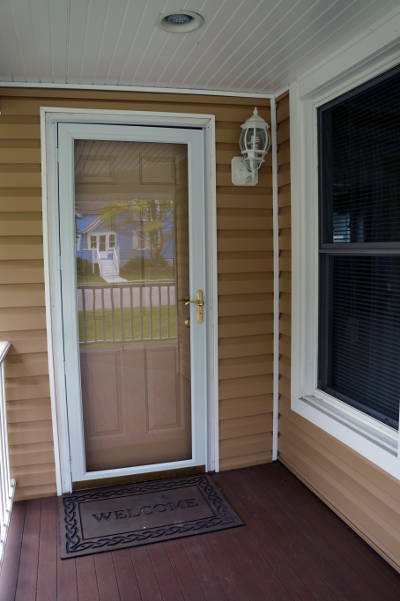 If increased security is one of your main concerns, look at storm doors which feature shatter-resistant glass, multi-locking systems with deadbolts and even protective grille work. Not only will these features help you stay safe while enjoying your storm door during the day, they’ll also help keep intruders from being able to break in at night or while you’re out of town. As previously mentioned, a good storm door can even help you keep your utility bills manageable. Look for one that has a center core of foam insulation, for an extra layer of protection against heat transference. Since exterior doors and glass are the biggest sources of transference in your home, it’s a good idea to make sure you’re picking something that offsets those factors a bit. You should also look for doors with low-emissivity glass, to shield you from UV rays and enhance energy efficiency. Where Can You Buy a Storm Door? If you know someone who has a nice storm door you like, ask them where they got it. You can also browse storm door websites like Feldco. We offer high quality, aluminum storm doors at affordable prices. Plus, all of our doors are installed by factory trained and certified professionals. Get a free quote now. Can You Install a Storm Door Yourself? You already know to consider style, material, security and energy efficiency. Now that you know what type of storm door you want, it’s time to prepare for installation. First, measure your door opening in order to find out what size of door to purchase. Most storm doors are 36 inches wide. Next, you’ll need to decide which way you want the door to swing. Too many do-it-yourselfers have purchased a new door, only to find out that it swings inward when they wanted it to swing outward! Find out this information beforehand to ensure a smoother process installing your door. Storm doors are a wonderful way to enjoy the sunlight and a nice breeze, but without the bugs and dirt. Now that you’re aware of the benefits of storm doors and a few things to be on the lookout for, you’ll make a more satisfactory purchase as an informed customer. When Peoria homeowners need a storm door, they get a free quote from Feldco. Our aluminum storm doors are made to withstand Illinois’ harsh weather and look great in the process. It’s no wonder over 350,000 homeowners have trusted us with their home improvement projects.